Moroccan spiced cranberry almond quinoa is the perfect healthy side dish. Quick and easy to prepare and packed with flavor! Cinnamon, mint, garlic, peppers and crunchy almonds add an exotic twist to a protein-rich quinoa. Do you love bread and pasta but are trying to watch your carbs? It’s often difficult to find a delicious and healthy replacement for pasta, rice or bread. I was lucky to be introduced to quinoa during college by my dear friend Jasmin. At the time we would bond over delicious home-cooked meals, wine, yoga, and hiking. These were our perfect ways to unwind after long days of studying. The flavors of this cranberry almond quinoa incorporate the flavors of the fall and winter for a wholesome and tasty seasonal side! I must admit, at first the very earthy and slightly bitter flavor of quinoa was not exactly the replacement I was looking for. The health benefits outweighed the taste, so I continued to give it a chance. I had to get a little creative with infusing more delicious flavors and textures with the quinoa as the base. 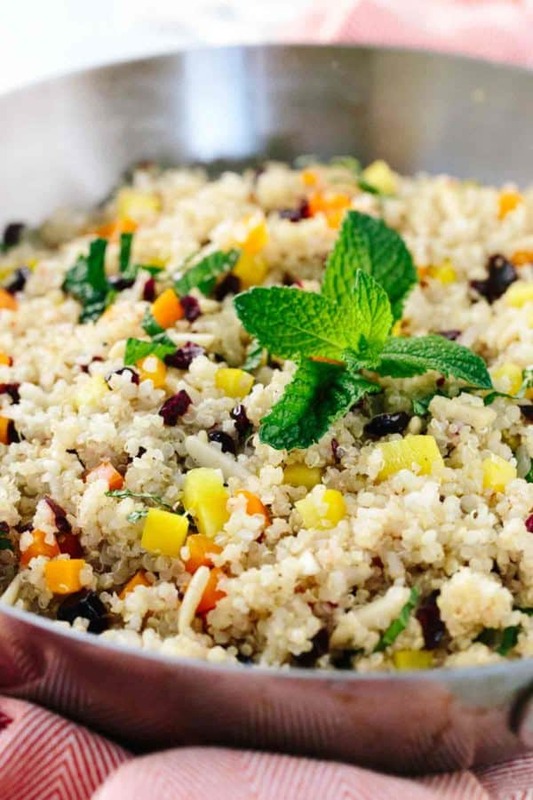 This recipe is an excellent way to incorporate fragrant Moroccan-inspired flavors with the health benefits of quinoa for a fantastic side dish! Wash First– When quinoa is in its natural state there is a coating of bitter-tasting saponins, making it tough to eat. Many manufacturers further process the seeds to remove the bitter coating. Even though most of the bitterness has been removed make sure to rinse thoroughly and wash under running water before cooking. Cooking– Quinoa uses a similar cooking technique as rice and requires about 20 to 30 minutes to prepare. You simply bring the quinoa and liquid to a boil then simmering over low heat until light and fluffy. Don’t open the lid until the end of cooking. Otherwise, steam will escape and not cook as efficiently. Allow the quinoa to rest covered, off the heat for about 5-10 minutes before serving to absorb the moisture thoroughly. Add Flavoring– The great thing about quinoa is that it readily infuses any flavors that you add to the cooking liquid. I used water for this cranberry almond quinoa recipe since the other ingredients are already so tasty. You can easily incorporate vegetable or chicken stock as the base. Feel free to add spicy peppers, tomatoes, herbs or other aromatics during cooking for even more flavor! I enjoy using Moroccan inspired ingredients like dried fruit, nuts, cinnamon and mint into my cooking. There are several Quinoa brands out there such as Bob’s Red Mill Grain Quinoa which is a great replacement and healthier alternative to couscous (semolina wheat), used in many traditional Moroccan dishes. Quinoa has a similar texture to couscous, as the grains are tiny and have a granular and tender texture. To add a little more texture to the quinoa, I used blanched almonds for some crunch (roasted chopped almonds can also be used), and sweet orange and yellow bell peppers. When you have your first bite of this cranberry almond quinoa, there should be warm sweet notes of cinnamon complemented with the refreshing slices of chopped mint, sweet bell peppers, and dried cranberries. If you are looking for something new to serve your hungry guests during the holidays or for a weekday side, this cranberry almond quinoa recipe would be a fantastic and easy side dish to prepare! What’s your favorite way to enjoy quinoa? I would love to hear your recipe inspirations in the comments section! Quinoa is a plant that is native to Bolivia, Chile, Peru, and parts of Mexico. Quinoa is of the goosefoot species, which the edible seeds used for cooking for application such as soups, salads, or ground into a meal for baking. Quinoa provides amazing health benefits by providing all nine essential amino acids making it a complete protein. If you are looking for a gluten-free alternative trying quinoa is an excellent substitute. Cranberry almond quinoa is the perfect healthy side dish, that is quick and easy to prepare and packed with flavor! Add quinoa to a fine mesh colander, rinse under running water, drain and set aside. Add 2 tablespoons olive oil to a medium-size saucepan fitted with a lid. Heat oil over medium heat, and then add minced garlic and onions. Continuously stir until onions are translucent, approximately 3 minutes. Add the washed quinoa to the saucepan. Add the water and salt. Bring quinoa to a boil, cover with the lid and reduce to a simmer until all of the water is absorbed, approximately 20 minutes. Check the quinoa, and allow to cook another 5 to 10 minutes longer if needed. The grain should look more translucent and the water absorbed. The quinoa should not look soggy. Turn off heat and allow quinoa to sit covered for 5 to 10 minutes to finish cooking. Taste the quinoa and season with more salt and freshly cracked pepper to your liking. Add the bell pepper, cranberry, almonds and cinnamon to the cooked quinoa, stir to combine. Add the mint just before serving gently stirring into the quinoa. Garnish with additional mint if desired. Made this and it was delicious! thanks! Your recipe calls for 2T olive oil, but the instructions use 1 t. What is done with the remaining olive oil? Thank you for catching that error Deb! I would use 2 tablespoons olive oil when sautéing the garlic and onions. I will update the recipe to reflect this. Thanks! What amount is the serving size? Hi Tatiana- The serving size is 3/4 cup. Thanks! How much Feta? Crumbled I assume. Have you ever added fresh spinach? There’s no feta in the recipe but it would be a tasty addition! Perhaps 2-4 tablespoons of crumbled feta would be good.